The best Romance audiobooks for the season, part 2! Welcome back to the best Christmas audiobooks to binge on. You’ve pürobably already seen my favourite Christmas audiobooks in the Audible Romance Package. If you missed it, click here. Today we’re looking at the best ones in Kindle Unlimited** “Read and Listen for Free”. You might know that with Kindle Unlimited you can read 1.4m ebooks for a flat monthly fee (you probably can’t really, because… 1.4 MILLION, but… you know… theoretically). What you might not know is that there are also over 2000 free audiobooks included in the deal. Additionally, there are thousands of audiobooks that you can pick up for as little as $1.99 if you borrow the ebook. The audiobook is then yours to keep! Kindle Unlimited is a great way to find new authors, but many well-known and popular authors have books in the program, too. You can only get Kindle books on your local Amazon website and deals might differ slightly. The list below is from Amazon.com and I cannot guarantee, that all of these books are “listen for free” on international Amazon websites as well. This is a prequel to the Sinclairs series and 3.5 hours of hotness! It’s a little bit of a Beauty & The Beast theme and gives you the all out Billionaire trope. Elizabeth Powers, who has a wonderful voice and way of intonation, did the narration. If you need something to warm you up, give the Beast a chance! Do you like a good enemies-to-lovers Romance? Do you like wine? Then this is for you! The book is narrated by Renee Raudman who also narrates all of Ilona Andrews’ books. With 4.4 stars in 352 ratings this audiobook is a great choice to get you into that Christmas spirit. This cover is so beautiful! It’s also a single dad Romance and I know you guys love that trope 😉 It’s narrated by Janet Metzger who has a lovely voice. Aw, nothing gives me such a cozy feeling as a second chance love in a small town <3 On top of that this one has just the right amount of rom-com mixed into it. Amy Rubinate is the narrator and definitely I like her a lot. She has so many amazing voices! This is Christian Fiction which is not my usual choice, but hey, it’s Christmas! And this is simply a wonderful Romance. If you have had Kindle Unlimited for a while, you likely have – like me – listened to the great Bell Harbor series. Let’s return there for a Christmas episode! It’s a wonderful dual narration by Nick Podehl and Lauren Ezzo. And don’t worry if you haven’t visited Bell Harbor before. This works as a stand-alone. If you want to give yourself an awesome Christmas present, get the Audible Romance Package with 30% off**! The offer will only show if you don’t have an active subscription. 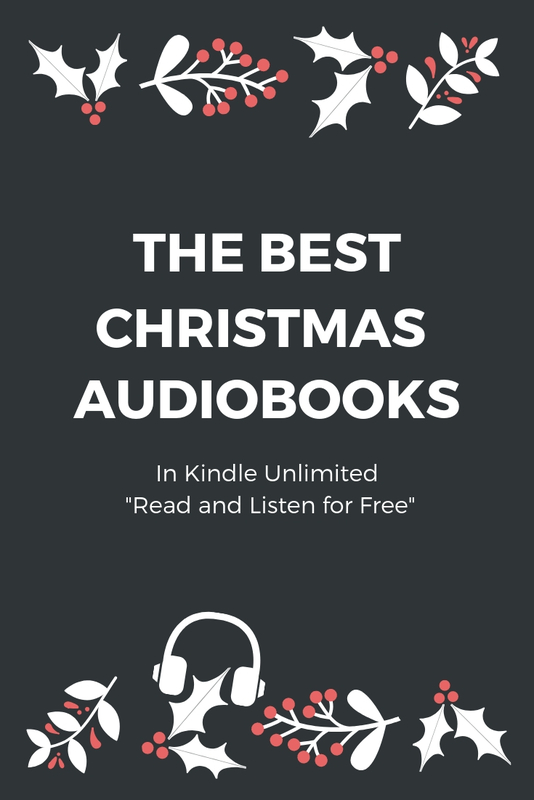 Or get your free Kindle Unlimited test month** and catch the Christmas deal there to listen to all these wonderfully romantic Christmas audiobooks I showed you above! A Kindle Unlimited subscription is also the perfect last minute gift for friends and family. There’s even a discount**! I LOVE Kindle Unlimited and always make great use of it but I’ve actually never used it for audiobooks! KU is awesome! I love the many choices of Fantasy audiobooks in the program. I found some of my favourite series there. And picking up cheap audio upgrades for books you borrow is also a really nice bonus.